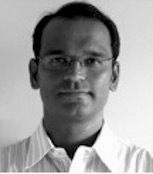 Shreyas Dhongde was born in 1971 in Mumbai. In 1995 he received his degree in B.F.A. from Sir J. J. School of Art, Mumbai. In 2001 he received his degree in M.F.A. from Sir J. J. School of Art, Mumbai. In 1999 he exhibited ‘Recent Works’ at Nehru Centre, Mumbai. In 2008 he showcased ‘Unplanned on Wellplanned’ at N.C.P.A., Mumbai. In 2014 he had one man show ‘Pattern’ at Jehangir Art Gallery, Mumbai. In 2009 and 2013 he exhibited solo at Artist’s Centre, Mumbai. In 1998 he took part in 11th Indian Oil Art Exhibition and 106th Bombay Art Society Annual Art Exhibition at Jehangir Art Gallery, Mumbai. In 1999 he participated in the 12th Indian Oil Art Exhibition and 107th Bombay Art Society Annual Art Exhibition at Jehangir Art Gallery, Mumbai. In 2014 he took part in the J. J. Alumni’s group show in Mumbai. In 2015 he took part in group shows ‘Silent Windows II’ and ‘Meher II - Art with a Heart’ at Gallery 7, Kalaghoda in Mumbai.